CHRIST THE CENTRE OF THE BIBLE. Christ in His Body. After the Lord ascended to the right hand of the Father, He sent the Holy Spirit to bring together a whole new group of people - the Body of Christ. This revelation was not known previously and Satan definitely would not have killed Jesus if he had known of this. This new group would be made up of people from Israel and the Gentiles, (nations). They would be joined together by the Holy Spirit and built up on the truth of Christ, His character and His purposes. This would take place over the centuries and across the world. Their inheritance would be to rule and reign with Christ on His own throne in the third heaven. This was where Satan, (Lucifer) had ruled previously till he was cast out. Thus we read in the book of Acts how this group was formed and guided by the Holy Spirit and through the Lord`s ascension ministries of Apostle, Prophet, Teacher, Shepherd and Evangelist. Amid opposition the different groups of believers grew in knowing the Lord and reaching out to others. The Apostle Paul was the one who received the revelation of the Body of Christ and it is through his writings, by the Holy Spirit that we learn of how the early believers functioned and learnt of the work of the Lord in their lives. In Romans, 1 & 2 Corinthians and Galatians we learn of the sufficiency of Christ. He is not an add on to other beliefs but the only way to the Father. It is through Him that we have Salvation, Sanctification and Justification. Then in Ephesians, Philippians, Colossians and 1 & 2 Thessalonians, we learn of our standing in Christ. He is the Eternal purpose of God, the Name above every name, preeminent in all things and will manifest Himself to His Body. 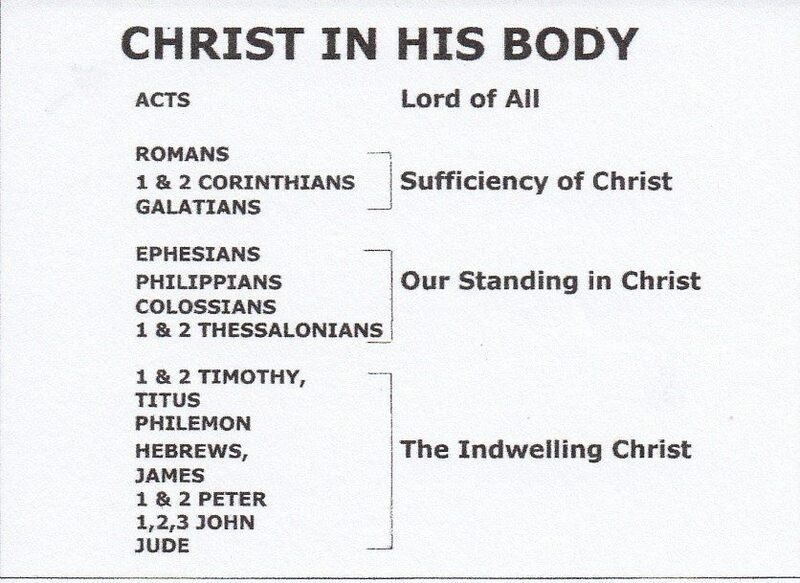 From 1 & 2 Timothy to 1,2 & 3 John we learn of the indwelling Christ. Here we are told of Christ`s character being formed in the believer - His grace, His life, His tender compassion, His enabling in practical duties and His strength in sufferings. He is our High Priest interceding for us in heavenly places. Finally in the book of Jude we read a summary of God`s word and this prepares us for the final unveiling of Christ in His heavenly Glory - Revelation. Previous entry CHRIST THE CENTRE OF THE BIBLE. John. Next entry CHRIST THE CENTRE OF THE BIBLE. Acts. hello Marilyn very interesting the overview gives each 'b00k' a landscape. loving the diagram! Thanks for your encouragement and so glad you are learning (as I did) more of God`s word and the Lord. 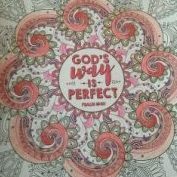 Looking at God`s word with the Lord as the focus really makes His word much clearer and bite size. BTW I do like your description mabel of `a landscape` a setting for each book.